A lot of affiliate programs only work with larger affiliates…and I think that’s wrong. I’m not judging people who decide to only work with a select group of needle movers, but I do think it’s a mistake. 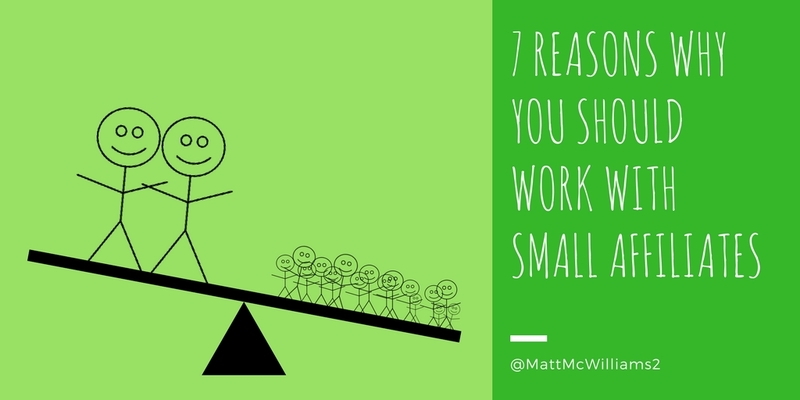 Below I share seven reasons why you should work with smaller affiliates. There is no better way to grow your list and your sales than picking up a few huge affiliates. They can explode your business literally overnight. But, for long-term growth, you need a farm system of smaller affiliates. Here are seven advantages to working with smaller affiliates. Or even just a few baskets. A good financial plan will have some of your money in slow-moving (big company) stocks, some in smaller, fast-moving (riskier) stocks, some in the middle. It will have some in Europe, some in Asia, and some in up-and-coming markets. Your money is spread all over the place. A good affiliate program will be just like that. You should have some huge needle movers. You should have some people who’ve been around for a couple of years and have built a medium-sized list. You should have some up-and-comers. And even some newbies. When you only have five affiliates and one drops out, you lose 20% or more of your sales. That hurts. When you have five hundred and a few drop out, your sales might go down a little. But definitely not enough to cause pain. RELATED POST: One of the best ways to diversify your affiliates is to recruit affiliates outside of your network. Here’s how to do that. When you had 10 people on your list, were you more engaged than when you had 100? Of course. 10 people are easier to keep track of than 100. The same is true with 100 and 1,000. Or 1,000 vs. 100,000. The larger the list, the less engaged you will be with them and the less engaged they will be with each other. We (and by “we” I mean internet marketers in general) often overlook the power of a close-knit list of less than 5,000 people. And yet, time and again, I’ve seen affiliates with small lists succeed in affiliate marketing. I’ve seen them take down giants (Mike Kim over Jeff Walker). I’ve seen them bring in $50,000+ in sales (Rachel Luna in Todd Herman’s launch). All because their lists were so engaged. One of the things I love most about smaller affiliates is that they are usually more open to learning. Translation: They aren’t set in their ways. The smaller affiliates are always looking to learn. They come to our affiliate trainings. They read the email tips we send out. They ask us questions. This allows us to teach them. And when we teach an affiliate how to make more money promoting a product, that naturally leads to reason number four. One of the things I’ve noticed over time is that affiliates who start working with us when they are small are usually the most loyal. In that first launch, they took really good care of me. And I made $588. My first affiliate commissions. The sense of loyalty I had for Michael after that was ridiculously high. I’ll never forget that feeling and I’ll never forget that it was Michael who gave me a chance even when I was a nobody with a small list. As a result of that one experience, I promoted him every chance I could get…which leads to reason number five. Speaking of Michael Hyatt, he has a launch coming up you should know about. His Free to Focus productivity course is launching again soon. Click here to learn more. Smaller affiliates are generally willing to promote you more often than larger affiliates. Less demand – Large affiliates get asked dozens of times each week to promote. Smaller affiliates don’t. Fewer internal product offerings – Smaller affiliates generally have fewer products of their own to promote, which leaves more time to promote you. Loyalty – When affiliates are loyal to you, they will jump at every opportunity to promote you. Which leads to the sixth reason we love smaller affiliates. When someone has 100,000+ people on their list, it’s hard to double in size. Don’t get me wrong, it happens. But it happens at a galacial pace. A small affiliate could easily double their list size with an optin change, a podcast interview, or $100 in Facebook ads. It happens all the time. Now their list size is twice of what it was when they started promoting you. But you still get the eagerness to learn. You still get the loyalty. You still get the open-mindedness and the commitment to promoting often. And you get to benefit from their list growth. A large number of committed, eager to learn partners with highly engaged lists that are growing. Who promote you every time you launch. Sound like something you’d want? This ultimately comes down to a numbers game. You could have three affiliates with 100,000 people each promoting you once. Or you could have 100 affiliates with an average of 1,000 people each promoting you a half dozen times each. That is a huge difference and doesn’t even account for the fact that the smaller lists will usually be more engaged and they smaller affiliates will be committed and all-in for you. As if all of this isn’t enough to convince you that you need to work with small affiliates, let me share one last reason. RELATED POST: My #1 Affiliate Recruiting Email REVEALED! The reality is that there are tens or even hundreds of times more small affiliates than large affiliates out there. If you choose to not work with smaller affiliates, not only are you passing up the benefits I listed above, but you are losing out on the massive impact they can have. When you have hundreds or thousands of affiliates, it creates a lot of buzz. I’ve run campaigns for companies like Shutterfly that produced more than 2500 blog posts within an hour. For a short time, it felt like we were everywhere…because we were. I’ve seen it happen so many times I’ve lost count. Hundreds or thousands of emails are sent, posts are posted, and tweets are tweeted all in a matter of minutes. It creates nearly unstoppable momentum. More affiliates want to join. When we recently launched with Michael Hyatt, we had 1532 affiliates on day one of the promotion. By day five, we had 1688. By the end of the launch, we had 1744. And we ended up with Michael’s biggest affiliate launch ever in a landslide. This was in very large part to working with a lot of smaller affiliates, many of whom were doing their first affiliate promotion. I encourage you to build your affiliate army. Don’t pass up the chance to work with someone who one day could be one of your large affiliates, just because they are small today. Remember these seven reasons and get out there and start recruiting your army today. And once you get the affiliates, you’ll need to activate them. Get all of my best activation emails here.